This story is about a city map of Willemstad (William's Town) in 1586, a city in the north-west of North Brabant, the Netherlands. With the help of close ups, not only you'll get explanantion by the map itself, but also extra information is given about for example Dutch fortifications. Willemstad (William’s Town) is a city in North Brabant, a province in the southern part of the Netherlands. The city is known as an unaffected example of sixteenth century fortification architecture and has been placed under the care of the Dutch service for building preservation. In the Middle Ages, Dutch cities experienced a slow, spontaneous growth. Because of that, there was little need for planning models. Later on, impolderings of ground outside the dykes were started. 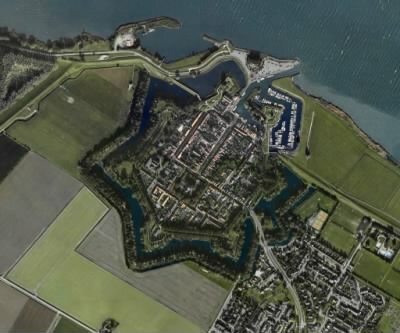 With the founding of a town in the new polder, the place for the new town was carefully chosen. Willemstad is a good example of this.